I had long dreamed of writing a book, but it wasn't till 2012 when I got the most awesome offer of my life - a paid offer to ghostwrite a book for someone - that I was pushed to stop making excuses and actually finish at least one book. I decided that I should write my own, as a practice run for my 'real' assignment. At this stage I had worked as a writer before, but never had I completed a whole book, from start to finish. Once I got going, I wrote in a bit of a feverish haze and finished the bones of this eBook in about 5 days. Margaret Haughey whipped my words into shape with her sharp and artistic editor's touch and Miranda Lees made it all look better than I had dreamed it could look. This book is by no means lengthy. But books do not need to be long to be worth reading ;-) After all, it is designed not for you to sit back in your chair while your dreams hide in the dirt ... it has been written to get you inspired and excited about your dream! 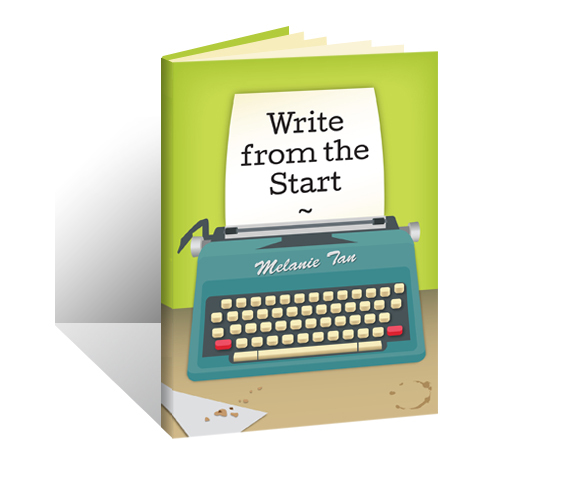 In "Write from the Start" you will find a budding writer's thoughts on writing, my best tips to inspire yourself and get started ... think of this book as your personal cheerleader companion saying to you, YES fellow budding writer, you CAN do this! But don't just take *my* word for it ... below are words from people who have read it. This is the book you want to read if you know you want to write, but find yourself lacking the inspiration or the motivation to get started. - Mark V.
It was rad. It's been awhile since I found a book that uses such economy of word and has such a nice clean layout. It really begs to be read. I specifically liked this quote "It doesn’t have to be perfect at first go. There will be time to edit it later". - Josh L.
This book seems to end too fast and it leaves me wanting more pages to turn. - Paul W.
I have been blogging, writing and procrastinating for the past 18 months and was a little skeptical before reading this book, but now I feel refreshed and motivated to write again. - Tracey A.
Mel provides very practical advice to aspiring writers and also encourages others to take up the challenge of writing about whatever they dream, think, feel, see, eat, experience. A must read!!! - Jacqui W.
Even if I didn't know you, it would make me feel like writing, but for someone that does know you a little bit more than just a name on a book cover ;) I have to say that it most definitely inspires me to want to do more writing with some helpful tips ... - Ariel C.
Awesome! Awesome! - Justin S.